As the fall salmon run winds down, steelhead activity picks up. In the rivers, water levels are up a bit after all the rain. Those with a good current should have a fair to good number of steelhead moving in. This is the time of year to catch muskie and pike because they go on a feeding frenzy. Inland lakes are usually good for panfish this time of year. Indian River Perch fishing has been pretty good on Burt and Mullett Lake. Fish up to 15 inches have been caught. A few walleyes are hitting, too. Waterfowl hunting has been pretty good, and the archery deer season is off to a good start. Deer numbers are up a little. Petoskey: Anglers harvested some fish past the mouth of the river, but many were thrown back because they were in pretty bad shape. Waders and anglers fishing off the rocks near the “bobber hole” were using spoons, flies, spawn bags, and skein. Most were fishing in the river, but some are fishing off the beach near the breakwall and off the piers with spoons or spawn. They have caught chinook, a couple pink salmon and coho. Bear River: The number of anglers as well as the number of salmon has declined. Water levels were up and the current was fast after the rain. Anglers using spawn, skein, artificial eggs or yarn have caught coho and pink salmon. A couple steelhead were taken but anglers are still waiting for that run to get started. Pink salmon were caught near the mouth and a 27 inch lake trout was caught on pink yarn at the dam. Charlevoix: Fishing was slow but steelhead and menominee whitefish were caught on a single egg just off the bottom near the Cement Plant. A few boats just off the pier may have been targeting perch. The area near Medusa Creek has slowed down quite a bit. The few anglers out there were using spoons, spawn bags, and single eggs. Traverse City: Anglers were mostly targeting perch, smallmouth bass, whitefish and cisco. Perch anglers were still-fishing with minnows, wigglers or shrimp. Most of the fish caught were small but those willing to sort out the small ones can still get enough fish to take home. Cisco were caught by those jigging 50 to 100 feet down in 80 to 120 feet of water. Perch fishing has been good on South Lake Leelanau, Long Lake, Big Glenn Lake, and East and West Bays. Elk River: Chinook, coho, steelhead, and lake trout have been caught near the power dam by those using spawn bags. Many of the coho are fresh but most of the chinook are deteriorating. More steelhead are starting to show up. The fish are averaging 6 to 8 pounds. Boardman River: The weir has been lifted. Anglers were targeting salmon, steelhead, and lake trout. Most of the remaining chinook salmon are in poor condition. The coho are in good shape and anglers should see more steelhead coming into the river very soon. Skein and spawn bags are producing the best. Frankfort: Both the Elberta and Frankfort breakwalls have been producing good catches of steelhead ranging 8 to 10 pounds. Most are using chartreuse and pink spawn bags with glow floats. The early morning bite was best as the action was hit-or-miss throughout the day. Those able to get out to the Bank did find three year old chinook, coho and steelhead 40 to 100 feet down in 150 to 200 feet of water. Onekama: The North Pier is still showing activity for coho and steelhead. They are hitting on spawn bags in the early morning. Those casting glow spoons in the pre-dawn have caught a couple steelhead. Portage Lake: Water levels are very low so the fish are in much deeper water. Bass and panfish were caught in 18 to 22 feet. Manistee: Pier anglers and those surfcasting are catching steelhead when conditions are right. They are fishing off the piers and the beaches. Manistee River: Salmon are on the definite downslide. Fish are still there but most are actively spawning and therefore not biting. Recent rain did bring some nice chrome steelhead into the river. Ludington: Pier and surf anglers are catching steelhead when using salmon spawn. Pere Marquette River: Rain did push steelhead up into the river. Most fish were caught on spawn. Those looking for salmon will still find a few fish however they are almost done spawning so they are not hitting anything. Pentwater: Pier anglers still-fishing with spawn are targeting steelhead however catch rates were very slow. Those surfcasting with spawn seem to be doing better. Cheboygan River: Anglers are still catching some fresh chinook salmon at the Cheboygan Dam. A couple steelhead were also caught by those using spawn. The run could go for two more weeks. 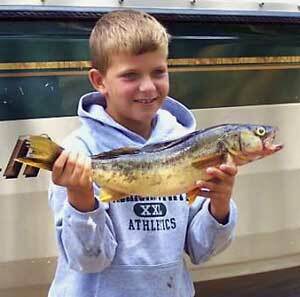 Rogers City: Brown trout are in the harbor in good numbers and anglers are just starting to catch them. There should be some excellent brown trout fishing in and around the marina and Calcite Harbor for the next few weeks. Try casting spoons, rapalas or rattle traps. Lures that agitate the fish seem to be working best early to mid-morning or late afternoon into the evening. Windy and nasty days were also a good time to fish. The few boats that are still going out have caught smaller chinook, steelhead and Atlantic salmon in 50 to 90 feet of water. Lake trout are numerous but the season is closed. Good colors are green, blue, orange and silver, black and white or purple. Use anything that glow early and late. Alpena: Yellow perch have been caught in the marina when using leaf worms and minnows. Early or mid-morning was best. Very few boats have been out. Thunder Bay River: Salmon are being caught near the 9th Street Dam and the bridge. Rapalas and spawn worked best. Some steelhead were taken on spawn. Yellow perch were caught near the 2nd Street Bridge. Harrisville: Salmon are still trickling into the harbor as well as the occasional steelhead. Small boats are still launching. They have caught a couple steelhead and walleye when long lining with spoons, body baits or J-plugs. Shore anglers are floating spawn or casting spoons. Au Sable River: Salmon continue to make their way up to the dam. Most anglers are drifting spawn or casting spoons. Recent rain has caused the water levels to come up and the current is moving swiftly. This will encourage more fish to come in. Look for the number of steelhead to increase as fall progresses. Tawas: Had a large crowd of perch anglers fishing off the pier. Some limit catches of 7 to 10 inch perch were taken. A few salmon and brown trout were caught at night. Tawas River: A few salmon were caught by those drifting spawn. Au Gres: When boats can get out, they caught some perch in the shipping channel, south of Pt. Au Gres and near the Rifle Bar in 25 feet of water. Au Gres River: Is producing some small perch. A few salmon are still being caught near the Singing Bridge. Keweenaw Bay: Those trolling have caught a mix of coho, chinook, steelhead and lake trout. The bite was slow but those putting in the time have caught a few fish 25 to 60 feet down in 30 to 70 feet of water up from the Falls River, Sand Point and north to Carla’s. Anglers fishing from the pier in L’Anse have done very well at times. Near the South Portage Entry, lake trout were caught on the southwest side of Big Reef. In Traverse Bay, lake trout were taken in 25 to 50 feet of water near Buffalo Reef. Fall’s River: Is producing coho and steelhead for those casting spoons and spinners or drifting crawlers and spawn bags. Marquette: Surface water temperatures were at 52 degrees. Boat anglers were averaging two to four lake trout with the occasional coho or steelhead mixed in. They are fishing primarily east of the White Rocks and from the Carp River to the Chocolay River in 60 to 150 feet of water. The lake trout had not yet moved in for spawning. Shore anglers caught a few coho. A couple steelhead were taken on spoons. Dead River: Angler activity was low. A few chinook salmon could be seen. Try drifting flies. Water levels are currently low. Menominee: Pier anglers at the marina and the lighthouse are still catching a few salmon but the fish are turning dark. Brown trout and steelhead have also been caught. Anglers are casting spoons and twister tails or jigging and still-fishing with spawn bags. Walleye fishing seems to be done. Those targeting them near the Cedar River caught smallmouth bass instead. Menominee River: Walleye fishing was very slow for the few boats going out. Night anglers fishing off the Cat Walk near the Hattie Street Dam caught a few walleye and smallmouth bass but not without putting in their time. Most were drifting rapalas in the current. During the day, those fishing off the rocks near the first dam at Hattie Street caught a few brown trout, steelhead, chinook and pink salmon. Some are drifting yarn or spawn while others are casting spoons, rapalas or twister tails. Little Bay de Noc: Walleye reports were mixed with most anglers fishing the northern bay and going as far south as the Black Bottom. The best reports came from those trolling stick baits in the evening between the Second and Third Reefs in 14 to 23 feet of water. Day anglers did best from the Black Bottom to the lighthouse when trolling or drifting crawler harnesses in 20 to 35 feet. Perch fishing was fair north of Butler Island in 14 to 25 feet. Good perch fishing in the Escanaba Yacht Harbor when still-fishing crawlers around the boat slips. Those fishing east and south of Butler Island caught northern pike on spinners or crank baits in 10 to 15 feet of water. Water clarity has been very good but water temperatures are still warm. Escanaba River: Shore anglers caught salmon up near the First Dam. Even though the run seems to be winding down, anglers reported the best catches of the season so far when using spoons, crank baits and J-plugs up near the active turbans. Big Bay de Noc: Reports have been few but some were still targeting smallmouth bass in Snail Shell Harbor. They are fishing 25 to 30 feet down off the drop or in shallow waters 8 to 10 feet deep. Most are using crawlers or minnows. The perch action in Garden Bay should start to pick up soon. Munising: Small boats were staying near the mouth of the Anna River and targeting coho, splake and whitefish. Catch rates were slow and most of the splake were sub-legal. Pier fishing decreased as catch rates were slow. The fish averaged 2 to 3 pounds and some were turning dark. A couple steelhead were caught but splake fishing continues to be unusually slow and the fish are running small. Grand Marais: Few anglers were out. Mild weather allowed a couple boats to go out trolling in the bay and near the Sucker River. Steelhead was the main catch along with the occasional coho. Light winds slowed the shore fishing for steelhead. No limit catches to report and most were lucky to leave with one or two fish. Boat and shore fishing around the bay have been impacted by the construction of the new breakwall. The water between the end of the new wall and shore is very shallow. St. Mary’s River: Smallmouth bass have been caught off Rocky Pointe and Birch Pointe by those jigging tube baits with skirts. Walleye are starting to bite on the north end of Munuscong Bay. Use planer boards with crank baits in 8 to 14 feet of water off the rock piles around Moon Island. This is also a good area for smallmouth bass when using minnows. A few muskie in the 38 and 40 inch range were caught east of Kemps Point near Tea Cup Island and the shipping channel. Anglers did best when trolling large crank baits or black rubber bodied shad. Detour: Walleye have been caught one mile north of Swedes Pointe by those trolling planer boards with crank baits in the early morning. As water temperatures drop and the light levels get lower, bigger fish are being harvested. Young salmon can still be found at the Detour Reef and Lighthouse. Yellow perch effort at the marina has not been good possibly because of the dredging and installation of the new docks. Off Drummond Island, yellow perch were caught in 10 to 12 feet of water on the south end of Ashman Island and Rutland Island. Some 9 to 11 inch fish were mixed in with the 7 to 8 inch fish. Cedarville and Hessel: Have fair perch fishing. Bush Creek and Beaver Tail Creek have salmon thanks to the higher water levels. Carp River: Still has a few chinook salmon and steelhead are also moving in and hitting on spawn. Water levels have come up so salmon are staging at Nunn’s Creek. Anglers have a great opportunity to cast out into Lake Huron for salmon when standing near the mouth. Lake Erie: Most anglers are targeting perch from Brest Bay to the E Buoy in 18 to 22 feet of water. A couple bigger perch were taken around the Raisin River buoys in 14 feet of water. Catch rates for walleye were slow but try straight out from Luna Pier in 16 feet of water. Those launching boats out of Sterling State Park need to watch for shallow water coming out of the channel as some of the buoys have been removed. Detroit River: Walleye fishing in the upper river has been good. Catch and release sturgeon fishing has also been good. Not much on bass fishing but the action should still be good for smallmouth. Muskie fishing has been good. Lake St. Clair: When boats can get out, fishing was very good. Perch fishing has been consistent with good catches off the Mile Roads, down to the Grosse Point Yacht Club and from Ontario waters. Muskie fishing has been very good. St. Clair River: Port Huron seems to be the only place producing fish. Shore anglers caught steelhead and the occasional chinook when using red eye spoons. A few walleye are still being caught at night. Lexington: Anglers are seeing more brown trout and salmon in the harbor but the bite was slow. Those casting spoons, rapalas or spawn have caught the occasional brown trout, steelhead or chinook salmon. A few perch were caught on minnows. Port Sanilac: Had a few brown trout in the harbor but the fish were not biting. 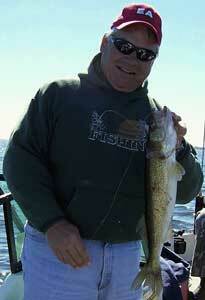 Harbor Beach: Walleye were caught off the north wall by those casting at night. Port Austin: A few perch were caught on minnows. Those casting did catch a couple chinook salmon. Saginaw Bay: Perch anglers have done well out near Spoils Island, in the old shipping channel and out near Buoy 18. A few are going out to the Spark Plug. Catch rates were slow from Quanicassee to Caseville except for a few small perch. Bluegill action in the marinas was hit-or-miss. Saginaw River: Is producing some perch at the mouth and out from the Bay City Yacht Club. Most are using perch rigs with shiners. A few walleye were taken at the mouth by those using jigs and minnows. St. Joseph: Pier anglers caught steelhead and whitefish on spawn. St. Joseph River: A good number of steelhead passed through the fish ladder at Berrien Springs. Shore anglers caught fish when drifting spawn bags while boat anglers picked up a few when casting plugs. The fish cam is back on line. Paw Paw River: Has more steelhead than salmon. Shore anglers are drifting or floating spawn bags. South Haven: Pier and shore anglers are casting spawn or body baits for steelhead. Kalmazoo River: Steelhead fishing is on and those drifting spawn bags are catching fish. Grand Haven: Is producing a couple steelhead and menominee whitefish off both piers. Still-fishing with spawn is the key. For whitefish try a single egg or spikes on a small hook. Catch rates were hit-or-miss. Grand River at Grand Rapids: Has steelhead and the occasional brown trout being caught all the up to the Sixth Street Dam. Some are using a pink or chartreuse spawn bags while others are trying a jig and wax worm. Hot-n-Tots seem to work well off the Fulton Street Bridge. Those fishing off the parks have caught crappie and bluegill on minnows, leaf worms or wax worms. Grand River at Lansing: Coho are still being caught but the action was starting to slow. Some are using small spinners while others are using small spawn bags. Pink and chartreuse were the hot colors. Muskegon: Anglers are steelhead fishing off the south pier however no fish were caught. One boat out trolling in 40 to 100 feet of water caught one steelhead on a gold and orange spoon. Muskegon River: Is producing steelhead and the occasional salmon below Croton Dam. Try casting small spoons, crank baits and spinners or drifting spawn. Whitehall: Anglers still-fishing with spawn have caught steelhead off the pier but the bite was slow. A few whitefish were also caught. Walleye fishing has been red hot in Raber Bay. Crawler harnesses have produced the best results. Perch fishing has been fair in Lake Huron at Cedarville but should improve as the water begins to cool. Muskie fishing has been decent in Munuscong Bay. Duck hunting has been slow, but goose hunters report some success. Grouse and woodcock hunting has been pretty good and bird numbers are up. Perch fishing has been good on Scotts and Maxton bays. A few pike and smallmouth bass have been caught, too. Archery deer season is off to a slow start. Grouse and woodcock hunting has been good, but waterfowl hunting has been slow. Perch fishing has been impressive on Big Manistique Lake, but anglers are having to sort through their catch to find the keepers. Walleye action is improving on Big and North Manistique lakes. Minnows have produced the best results when fished with jigs or under slip bobbers. Grouse and woodcock hunting has been decent, but foliage is still thick and hunting has been tough. Bear hunting has been good, but the archery deer season has been slow. J.R. Sport Shop, (906) 586-6040. Smallmouth bass are keeping anglers busy on Lake Michigan’s Big Bay de Noc. Sucker minnows fished in 30 feet of water are producing good results. Perch fishing has been slow in Garden Bay but should improve as the water temperature drops. Grouse hunting has been pretty good. Archery deer season is off to a slow start, with warm weather hampering deer movement. The Garden Sport Shop, (906) 644-2908. Fishing pressure has been light on Lake Michigan’s Little Bay de Noc. Walleye fishing has been good south of Escanaba between the Ford and Cedar rivers. A few salmon are being caught on crankbaits in the Ford and Escanaba rivers. Perch fishing has been fair in the bay. Fish are still scattered, but action should improve when the water begins to cool. BayShore Resort Bait & Tackle (906) 428-2950. L’Anse Area Anglers trolling near shore are catching decent numbers of cohos and a few kings around the river mouths. Grouse and woodcock hunters report high flush rates. Deer hunting has been very good and deer numbers appear to be up. Walleyes and smallmouth bass are hitting sucker minnows on Lake Gogebic. Rock points and sand points have been the hot spots for smallies, and walleyes are hitting along near-shore hard-bottom areas. Perch fishing has been good along the weedbeds. Grouse hunting has been good. Bird numbers are down a little, but hunters report up to 30 flushes a day. Deer numbers are up in the western Upper Peninsula. Grouse hunting has been pretty slow in Ontonagon County. Archery deer season has been slow. Lake trout fishing has been good on Lake Superior at Silver City. Anglers report a good bite in 140 feet of water, 70 feet down. Grieg’s Taxidermy & Tackle, (906) 884-2770. Perch fishing has been pretty good on Burt and Mullett lakes. Fish up to 15 inches have been caught. A few walleyes are hitting, too. Waterfowl hunting has been pretty good, and the archery deer season is off to a good start. Deer numbers are up a little. Perch Fishing has been fair on Lake Charlevoix. Waterfowl hunting has been good, and the archery deer season is off to a fair start. Grouse and woodcock hunting has been solid. Tom’s Bait & Tackle, (231) 536-3521. 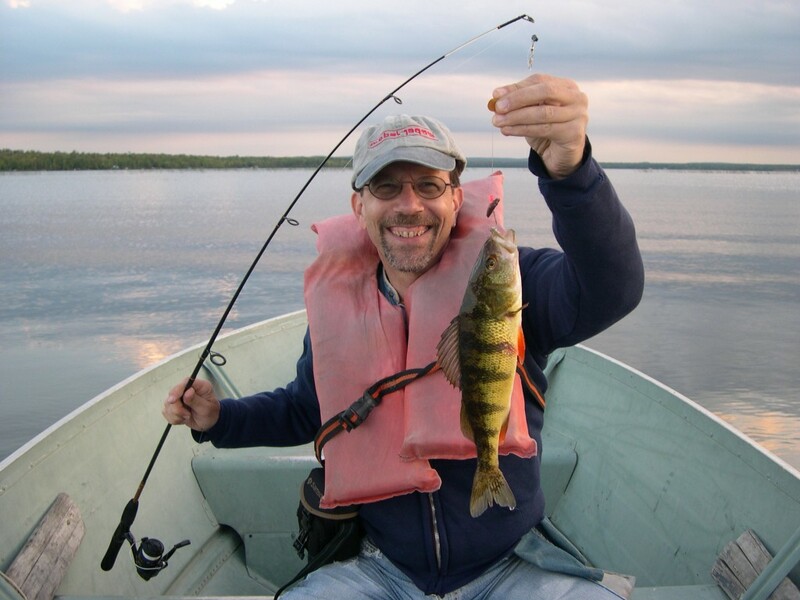 Perch fishing has been good on South Lake Leelanau, Long Lake, Big Gleen Lake and East and West Bays. Grouse and woodcock hunting has been good, and bird numbers appear to be up in the area. Perch and walleyes are hitting on Houghton Lake. Anglers fishing with nightcrawlers and minnows report good action in 10 feet of water. Grouse hunting has been good, and the archery deer season has been fair. Perch fishing has been pretty good on Higgins Lake. Anglers fishing with minnows in 30 to 50 feet of water around the island are catching good numbers of fish. Grouse and woodcock hunting has been pretty good. Bird numbers are up. Archery deer hunting is also off to a good start. Phoenix Party and Bait Store, (989) 821-7220. It’s that time of year again. When you wake up in the morning and have to scrape your windows before you drive to work in the dark and you are lucky to see daylight when you get home from work. But there is one good thing about this time of year. It is going to start forming ice. After the ice starts it is time to break out the ice fishing gear. Before any ice fishing season you should go through all your equipment and test it at home before venturing out on any lake. This will save you many headaches and cold fingers out on the lake. First of all I check my ice fishing clothes and wash them before the season starts. I make sure my long underwear is in good condition as well as all my outer wear. Make sure to patch any holes or replace it before the season because there is nothing like a nice December wind blowing through you outerwear right onto your clothes to put a chill into you. Make sure you have a fishing towel. I prefer to use a golf type towel so I can hang it up in my ice shack so the heater keeps it nice and warm and dries it faster. This is actually a necessity on the ice so you can dry your hand after handling fish or minnows. This will keep your hands a whole lot warmer. Invest in some quality socks. My favorite socks are Black mountains from The Gene Edwards Company. They are fairly expensive but well worth the money. They stay up on your leg even after walking great distances and wick the sweat away from you while retaining the heating qualities. Good quality outwear is a must as well. Try to get something with at least a waterproof lower because of the constant kneeling in the snow and water near the holes. Boots and gloves are very critical too. I prefer Rocky and La Crosse boots. I have owned both and they are both warm and comfortable. Also pick up a pair of ice cleats especially for early ice when there isn’t any snow yet. After you get your clothes ready and make sure everything is in working order including the zippers and any tie downs it is time for the fishing equipment. I check all the assemblies of my rod and reel combos. Make sure the reel is securely attached to the rod. Then change all the line on the reels. I use Berkley’s Micro Ice line. Make sure the reels are lubed and ready for the season so you don’t get unwanted squeaks or reel hitches on the ice. The frozen air will accentuate the problems. Tip-ups should have their braided line changed at least every other year. Use one that won’t freeze up or kink. Then tie some new monofilament leaders. I prefer a 2-4 foot leader. I also make my own steel leaders for northern fishing as well using braided wire. Make extra leaders up ahead of time so you don’t have to tie on hooks out on the ice and you can just unclip it and put a new one on. Make sure to use a good swivel for you tip-ups as well. Check the grease in the tip-ups to save it from freezing up on the ice too. Also check the condition of the flags. If the flags are torn or loose on the shaft replace them. Now that your rods and tip-ups are ready to go it is time for the ice shack. If you have a portable shack set it up in the garage or your yards and make sure the sled is in good condition and patch any holes or trouble spots. Check the canvas thoroughly. Patch any holes in the canvas and spray it down with a water repellant spray to make sure that water doesn’t leak in as much as possible. Check all the pivot points and tubing as well. On a permanent shack you will want to check the runners and make sure they are solid and not rotting or cracked. Check the walls and make sure they are not damaged as well as the windows. Check the floor to make sure there are no weak spots or rotten boards. Replace all broken or week parts of the shack. Ice augers are one of the most important items in ice fishing. There are several types to choose from. I usually use a spud bar early in the year but mainly to check ice conditions every few feet. Ice can for very unevenly and safety is first priority. I like to use a hand Lazer auger early in the year or when fishing in large groups of pan fisherman because some are offended by power augers even though I don’t personally feel they affect the fish even in shallow water. I have drilled hundreds of holes in as shallow as 3 feet and seen fish under my hole right after drilling with my Jiffy power auger. I do use a power auger most of the year because I drill many holes per day to find and follow fish as they move. The main thing to check on the augers and spud bar is to make sure they are sharp. Any blades should be replaced or sharpened before the season start. Power augers should have new gas put in them and a new spark plug and then test to make sure it is running properly. If it is not running properly take it to a small engine repair shop for a tune-up to insure a year of good use. It is a lot better to know your auger will work before you drag it out on the ice and it doesn’t run. I always carry an extra spark plug with me too as they tend to foul out occasionally. Once your augers are ready it is time for the rest of your ice fishing gear. Make sure to have your tackle ready to go. Untangle all you tackle and sharpen hooks or replace them with new ones. Also on new jigs punch the eyes out before putting them in you tackle box to save time and possible cold fingers having to do it on the ice. Next up is your heater. Check all the connections and test your heater. Make sure the heater is in good working order. If it flames up get it serviced so it will run properly. Another useful tool on the ice is a lanyard. I put a jaw spreader, depth finder, clippers, jig eye cleaner, and forceps on them for easy use. Other useful tools a 5 gallon bucket for your fish which I line with a garbage bag so I can remove the fish easily after fishing and it doesn’t make a mess out of my bucket. Grocery bags work well for this. Check the condition of your bait bucket for leaks or cracks. Make sure your minnow scoop is in good order as well. They are very cheap to replace. I prefer the floating nets so I don’t have to stick my hands as far into the water. If you have a Vexilar or Aqua View make sure to charge the batteries and test them before taking them out to the lake. After you have everything ready to go and head out for the lake be extremely careful to be sure that the ice is safe. I don’t like to go onto ice thinner than 3 inches. Make sure to test the ice every few feet to insure safe travel especially if you are the first one out. Remember think safety first, be considerate to others out on the ice, don’t leave any trash out on the ice even if it isn’t yours, and if you check all your equipment first you will have a safe successful season. Man reels in record breaking fish in Antrim County. Joseph Seeberger from Portage caught a Great Lakes muskellunge at 58 pounds, 59 inches long. He caught the fish October 13th on Lake Bellaire in Antrim County, he was actually bass fishing with a minnow at the time. He said it took two hours and two friends to help reel in the fish. 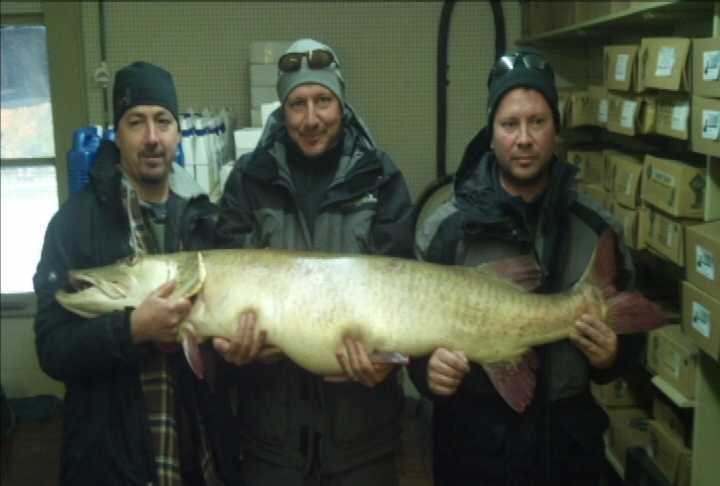 The previous state-record Great Lakes muskellunge was caught on Torch Lake in Antrim County in 2009. That fish weighed 50.5 pounds and measured 56.13 inches. 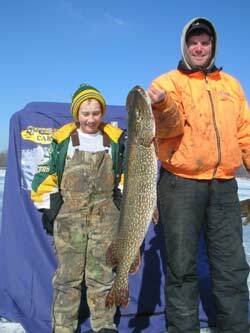 A record breaking fish must exceed the current listed state-record weight and identification must be verified by a DNR fisheries biologist. The state received lots of rain, particularly the areas north of Cadillac. This should bring the last of the chinook salmon to the gravel then the fish will be done. Increased water levels should also bring more steelhead into the rivers. Fewer anglers were out and most of the big water boats have been put away for the winter. The inland lakes are producing some panfish. Anglers are reminded that all Type 1 and Type 2 rivers and streams along with the Type A and Type D inland lakes closed to fishing on September 30th. Lake trout season on the waters of Lake Huron and northern Lake Michigan also closed on September 30th. 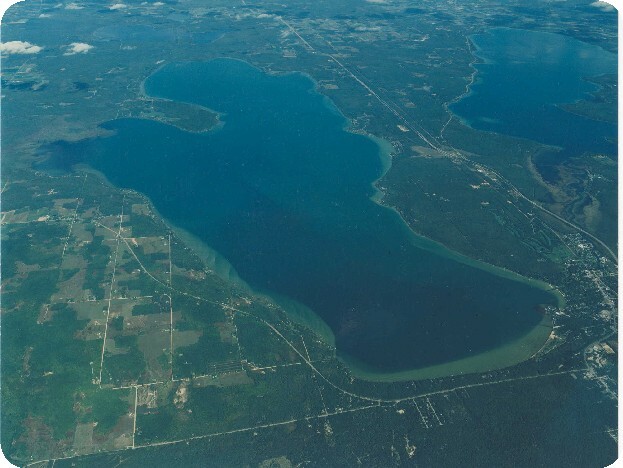 The waters of Lake Michigan between Arcadia and New Buffalo will remain open for lake trout until October 31st. Fisheries Division is asking for your cooperation in completing a survey by the University of Toledo regarding the use of live bait. The purpose of this survey is to find out what factors Michigan anglers consider when choosing live baitfish. Some types of baitfish can be infected with viral hemorrhagic septicemia (VHS) and the disease can be spread to many species including sport fish in the Great Lakes area. The results of this survey will be beneficial to the division regarding future bait regulations. The survey can be found at http://uac.utoledo.edu/uacsurveys/lecmfs.htm. Perch fishing has been good on Mullet, Burt, Big Glen, Big Platte, Lake Leelanau, lake Margrethe, and Crystal. Harbor Springs: Had very few boat anglers. A couple smallmouth bass were caught in 30 feet of water. Petoskey: Those wading and those fishing off the rocks are still catching fish past the mouth. Try crank baits or floating spawn bags. Those surfcasting off the beach and near the breakwall caught fish using crank baits or spoons. Orange and green were still the hot colors. A couple coho and pink salmon were caught right along with chinook. Some have started to target steelhead with spawn but it might still be a little early for them. Bear River: Did not have as many fish as last week but quite a few are still being caught. Try spawn, skein, or yarn for chinook, coho and pink salmon. Charlevoix: Fishing was slow. Even the cold, wet weather did not bring salmon up to the weir. Boat traffic seems to have stopped on the big lake. Most anglers were fishing 100 feet from the mouth of Medusa Creek with crank baits. Steelhead should be near the cement plant soon. Traverse City: Few boats have made it out because of the weather. Those that did were targeting smallmouth bass. Elk River: Chinook, coho, steelhead, and the occasional brown trout have been caught. Most anglers are using pink or chartreuse spawn bags at the power dam. Boardman River: The salmon run seems to have peaked but a decent number of chinook and coho remain in the river. Some have caught lake trout. Try drifting skein and spawn bags or fly fishing with an egg-sucking leech pattern. Frankfort: The weather gave the steelhead a good push. Pier anglers at Frankfort and Elberta have landed some nice fish when using spawn. Chartreuse seems to be the better color. Water levels are still low and those working the shallow waters have done well. When boats can get out, they caught young chinook and coho when fishing 80 to 100 feet down along the Shelf. Spoons worked best. Betsie River: Could see some steelhead by the weekend. Onekama: The North Pier was very active with several nice steelhead and some coho caught by those using spawn or cleo’s that glow. Chartreuse spawn bags with glow floats were the ticket this week. 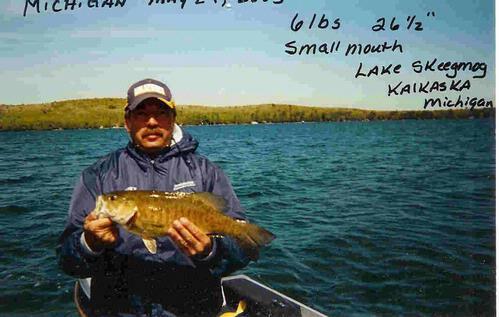 Portage Lake: Bass anglers who braved nature were not disappointed when catching several 4 and 5 pound largemouth as well as some nice smallmouth bass. Work the drops in both shallow waters and those 14 to 18 feet deep. Panfish were slow but anglers are hopeful that colder temperatures will get them feeding. Manistee: Strong winds have prevented boats from going out. Pier anglers and those surfcasting have started to catch steelhead on fresh spawn. Those using a single fresh egg caught a few whitefish. Manistee River: Should see good numbers of steelhead by the weekend. The last of the chinook salmon should be on the gravel and pretty much done by the end of the week. Ludington: Pier and surf anglers are catching steelhead when using salmon spawn. Strong winds have made it difficult for boats to get out. Pere Marquette River: Did not get as much rain as the rivers north of Cadillac but anglers should still find some steelhead. Cheboygan River: Is producing chinook salmon at the dam for those using rapalas, cleo’s, shallow runners and spawn. Glow works best at night. Rogers City: If boats can get out, steelhead and Atlantic salmon were caught between Seagull Point and Forty Mile Point. The fish are higher now and can be found 35 feet down in waters 65 to 90 feet deep. Good colors are green, blue, black and silver, orange and silver or anything that glows. The marina and the fish cleaning station are now closed but the docks are still in. The salmon run up to the Swan Weir is just about over but a few fish may trickle back down into the bay. Ocqueoc River: A few salmon have been caught by those drifting spawn or casting body baits. Quite a few fish are pretty dark now. Presque Isle: The marina is completely winterized. The docks will be in until the end of the month. Rockport: Pier anglers caught chinook early or late on rapalas. Alpena: A few chinook and pink salmon were caught near Mill Island in Thunder Bay. Yellow perch have been caught in the marina by those using minnows. Thunder Bay River: Is producing chinook up near the 9th Street Dam. Try floating spawn or using rattle traps. Steelhead are also being caught. Harrisville: Salmon are still coming into the harbor, but in small schools. Most of the fish are still fairly fresh and in good shape. Spoons, body baits and spawn are all taking fish. There have been reports of steelhead following the salmon in and hitting on the same baits. Water levels are low but there is still plenty in the channel. 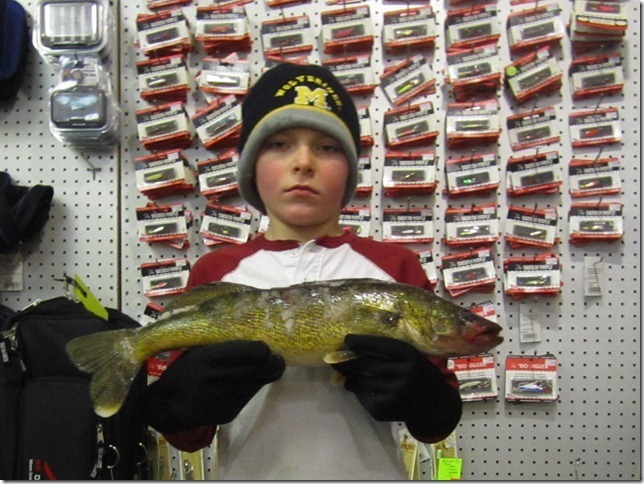 Oscoda: A few walleye were caught off the end of the pier. Au Sable River: Salmon are making their way up to the dam. Fish down near the mouth are silver but further up some of the fish are starting to turn dark. Steelhead are making their way up as well and were hitting on spawn. Water levels are starting to come back up and the current is moving faster. This should bring more fish into the river in the coming days. Higgins Lake: Is producing a few perch. Lake St. Helen: Is producing a few pike. Tawas: Pier anglers did well for perch when using minnows. Those fishing outside the piers caught chinook, steelhead and catfish when casting spoons. Tawas River: A few salmon were still caught by those drifting spawn. Au Gres: Had good perch fishing in 35 to 40 feet of water along the shipping channel. Au Gres River: Rumor has it salmon and steelhead have been caught. Those surfcasting in the lower drain near the Singing Bridge have caught salmon. Black River Harbor: A few salmon are still being caught below Rainbow Falls. Ontonagon: High winds are keeping boat anglers off the water. A few small salmon were caught in area rivers. Keweenaw Bay: Boat anglers that can get out have caught mostly coho followed by lake trout and steelhead. They did best between Sand Point and Carla’s which is north of Baraga. Those fishing off the rock dock caught coho and steelhead. Marquette: Surface water temperatures have cooled to the upper 40′s so fishing has improved. Lake trout and steelhead were caught outside the Lower Harbor breakwall and up towards the Carp River. The fish are running 3 to 6 pounds. They are staging before the spawn but the run has not peaked yet. Shore anglers are fishing off the Lower Harbor breakwall and from the mouth of the Carp River to the Dead River. A couple nice steelhead were caught off the Upper Harbor breakwall. Carp River: Coho action was fair with the occasional fish caught on spoons or spawn. An increase in water levels should increase catch rates. Dead River: The salmon run may have peaked as most of the fish in the river appear to be done spawning. Most are using flies. Menominee: Pier anglers at the marina and the lighthouse caught the occasional salmon but the fish are turning dark. A couple brown trout were caught by those casting spoons or twister tails. Walleye fishing seems to be done. Menominee River: Walleye fishing was slow. Those targeting smallmouth bass, pike and musky also had reports of slow fishing. Water levels were still low but recent rain may help to bring levels back up. Chinook, pink salmon, steelhead and brown trout were caught near the first dam at Hattie Street. While some are drifting yarn or spawn others are casting spoons, rapalas or twister tails. Little Bay de Noc: The Kipling area has been fished the most with perch and walleye caught. Perch anglers were still-fishing with crawlers in 4 to 10 feet of water around Butler Island but many were small. Walleye anglers did best late evening when trolling or drifting in 10 to 23 feet of water at the Second and Third Reefs. Escanaba River: Shore anglers are casting for salmon but few fish were caught. Big Bay de Noc: Smallmouth bass by those anchored or drifting with crawlers 25 to 35 feet down between the Bluff and Snail Shell Harbor. St. Mary’s River: Those trolling the north end of Munuscong Bay caught a few walleye around Moon Island when trolling crawler harnesses in 8 to 12 feet of water. As water temperatures get colder, change to crank baits when targeting walleye in the month of November. A few musky were caught by those trolling 8 to 10 inch rubber body shad baits around Tea Cup Island and Kemps Point. Smallmouth bass are excellent around Moon Island when using minnows or jigging with dark green and brown tube jigs. A few yellow perch were caught mid-afternoon across from the Neebish Island Ferry dock or the west side of Neebish Island just off the weed beds. For perch, try out near the red buoy or off Green’s Resort in 12 to 18 feet of water. Detour: A few walleye were caught out from the DNR Boat Launch. Anglers are trolling crawler harnesses and bottom bouncers in 12 to 18 feet of water. Around Drummond Island, perch were caught in Scott Bay or try the south side of Ashman Island in 8 to 12 feet of water with minnows. A couple perch were also caught near Harbor Island and Bald Island. Good smallmouth bass fishing around Bruce Point. Try minnows or tube jigs in 4 to 8 feet of water around the rock piles. Cedarville and Hessel: Anglers are targeting yellow perch in Musky Bay and the Middle Entrance in 10 to 12 feet of water. Most are using minnows. Carp River: The pink salmon are almost done but chinook are moving into the river. Lake Erie: When boats can get out, they have done well for perch. Hot spots were around the Raisin River Buoys in 13 to 18 feet of water and off Stony Point in 22 to 24 feet. For walleye, try out from Luna Pier in 16 feet of water. Huron River: More steelhead should be moving up into the river soon. One fish was caught up at Flat Rock. Try floating wax worms, minnows or a single egg. Shore anglers caught some nice perch. Detroit River: Walleye anglers jigging in the lower river are catching a few fish. Perch anglers are also picking up a fair number of fish. Try the Cross Dike near the south end of Grosse Ile in 10 to 15 feet of water or the west side of Celeron Island in 8 to 10 feet of water. Shore anglers have caught 10 to 14 inch perch. Lake St. Clair: Once the winds die down and anglers can get back out, perch fishing should be very good. Best areas to fish this time of year are off the 400 Club and the Grosse Point Yacht Club. Muskie fishing should also be good around the weed beds in Anchor Bay and along the St. Clair Delta Channels. Walleye fishing should also pick up in the channels as water temperatures continue to fall. St. Clair River: Fishing activity has been slow. Anglers continue to fish off the boardwalk in Port Huron with limited success. Lexington: Is producing the occasional steelhead and brown trout. Anglers are casting spoons or using spawn. Baitfish are showing up along the breakwall. Anglers did best in the early morning or late evening. A few perch were seen around the docks at the marina. Saginaw Bay: Shore anglers were catching a few small perch at Quanicassee, Sebewaing and Caseville. 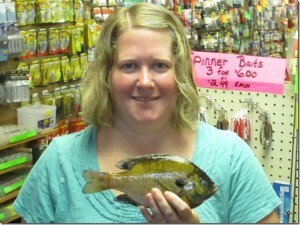 Those able to fish in the marinas have caught bluegill and crappie. Gizzard shad were starting to move in. Shiawassee River: Is producing a good number of smallmouth bass. St. Joseph: Pier anglers using spawn caught steelhead and whitefish. St. Joseph River: Water flow has increased but levels are still below normal. The salmon run is winding down however no big push of steelhead yet. The fish cam at the Berrien Springs ladder is temporarily disabled due to some technical difficulties. It may be down for a few days. Paw Paw River: As the salmon run winds down, steelhead are moving in. Many are using spawn. Kalmazoo River: Has a fair to good number of salmon and steelhead below the Allegan Dam. Try spawn, Hot-n-Tots, small spinners or floating wax worms. Grand River at Grand Rapids: Has a good number of steelhead along with some brown trout. Anglers are doing well at the dam and the stretch before the dam with pink or chartreuse spawn bags with about 4 eggs. Use light line 4 to 6 pounds and small hooks. Those fishing off the Fulton Street Bridge caught trout on Hot-n-Tots. At Riverside Park, crappie and bluegills were hitting on minnows, leaf worms or wax worms. A few walleye were caught on the gravel at night when back bouncing. Grand River at Lansing: Salmon fishing picked back up with coho caught in the Grand and the Red Cedar. Fishing picked up at the North Lansing Dam as the number of fish increased. Most are using small spinners. Pink and chartreuse were the hot colors. Looking Glass River: Has lots of northern pike but most are on the small side. Calhoun County: Duck Lake was producing good numbers of bass, bluegills and other panfish. Those fishing Lake of the Woods and Warner Lake caught a small number of nice bluegills. Reeds Lake: Is producing crappie, bluegills and even some perch. Muskegon River: Salmon are still being caught below Croton Dam. Anglers are casting small spoons and crank baits or drifting spawn and wax worms. The rain did push some steelhead into the river. 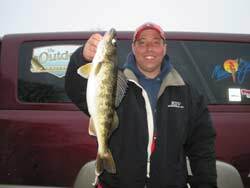 Perch are biting on West Grand Traverse Bay off M-72 with quite a few boats out Saturday.